Ah… Austrian Death Machine. This band, particularly their debut album, may always hold a place in my heart, however unwanted it may be. See, early 2008 was when I started to really get into Thrash Metal, and Governator Ah-nuld (The Gummy Bear of Candycornia) released his brand of Metalcore-infused Thrash Metal upon the masses soon after, expecting inexperienced Thrash munchkins to eat it up; unfortunately, I happened to be one of those at the time, gathering as many modern bands of the genre as I possibly could to fill my expanding library. ADM, along with Warbringer, Toxic Holocaust, and others, now inhabit a corner of my musical journey as my first real forays into the Thrash scene. Unfortunately, when I discovered that 80’s Thrash bands were infinitely better than 95% of all modern Thrash outfits, most albums I had once loved were put on the back burner, giving way to superior albums from Kreator, Slayer, and the like. But when I heard that ADM was releasing a new, two-disc album, the latter half being entirely composed of cover songs (Including takes on Goreture and MOTORHEAD!! ), I was quite intrigued, and perhaps even a bit nostalgic, at the thought of a new album from a band I had pushed away for so long, and I snatched up Double Brutal at my first available opportunity. Well, if there’s anything that Double Brutal has done for me, it’s certainly reaffirmed my faith that the best Thrash Metal has already been made long, long ago. It's not bad by any means (Hell, at least Austrian Death Machine is better than Municipal Waste), but it really has no relevant place in the current Thrash scene. Tim Lambesis’ (Who plays all the instruments and vocals) main gimmick – spoofing Arnold Schwarzenegger – has not only worn thin by now, but the jokes are simply unfunny and poorly used this time around. The only time I laughed on one of the “Skits" was with Intro To The Intro, where Arnold attempts to “Sing” the T2 movie theme. The Schwarzenegger impersonator (Chad Ackerman of Destroy The Runner), for some reason, sounds weaker than before as well; or rather, less like Arnold than before. The first disc of all original songs, unfortunately, is completely void of inspiration and originality. You’ve heard all the riffs here before, and unless you really, REALLY enjoyed Total Brutal, you can safely pass it by. Most of the disc relies on the Arnold shtick to barely scrape by, and attempts at being cute are typically groan-inducing; Who Told You You Could Eat My Cookies? tries to make fun of the Deathcore genre with “Cookie Monster” vocals, and it would’ve been pretty damned funny… if the music had actually been good. Some of the guitar work (especially towards the latter half of the CD) is actually pretty aggressive though, and hearing the quote “Come on, do it, do it, come on, come on, kill me, do it now!” (Featured on the track of the same name) recited at hyper speed is quite entertaining. But half of the songs are rather boring, and sometimes fly in one ear and out the other because of Lambesis’ lack of ability to consistently write good hooks; There are only five tracks here that I really enjoyed. The first is at the very beginning (I Need Your Clothes Your Boots, And Your Motorcycle; it’s actually pretty damn catchy! ), and the other four are also the last four tracks on the album (not counting the last lame Schwarzenegger “Spoken” track), leaving a load of filler in the middle, and making the disc very unbalanced. The fact that the songs are all rather short (The first disc is twenty nine minutes long) doesn’t really help matters either. The second disc (The “Covers” album), however, is much more entertaining as a whole. Think that ADM covering Motorhead or Megadeth would sound horrible? Think again. Some of these tracks are essentially just the original products with more modern production and Metalcore vocals (Trapped Under Ice and Hell Bent For Leather), but others are really, truly fun, especially with Arnold popping in at various points throughout the songs. Listening to him whoah-oh-oh ing along on the chorus of The Misfits’ I Turned Into A Martian or shouting out “Snake bite kiss!” on Iron Fist (One of my favorite Motorhead songs by the way) is funny enough to elicit a chuckle; to bad the bad skits aren’t. The cover of Megadeth’s Killing Is My Business… And Business Is Good is plain awesome, with riffing that’s tight as spandex and production that’s infinitely better than the original version. But the most entertaining song of all is the cover of Agnostic Front’s Gotta Go, which features Schwarzenegger attempting to address the nation about the impending Skynet invasion while the rest of the band shows no regards to the danger and continues playing along. It’s laugh-out-loud hilarious and very well performed, and ends the double-disc record on the best possible note. As much mindless fun as the cover disc is, it’s not enough to warrant a full purchase of Double Brutal, as the original material displays nothing but mostly tired riffs and bland jokes that lost their firepower somewhere between this album and the debut. Die-Hard fans only need apply, unless of course you’re looking for a fun and simple Thrash Metal album where you can shut off your brain and senselessly bang your head for about an hour or so. But really, Tim Lambesis… you can stop now. 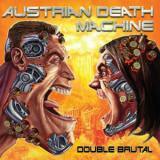 Austrian Death Machine simply isn’t relevant or very funny anymore, even if it is decent as a quick Thrash fix. And really, if that’s what you desire, then you can do FAR better than Double Brutal.